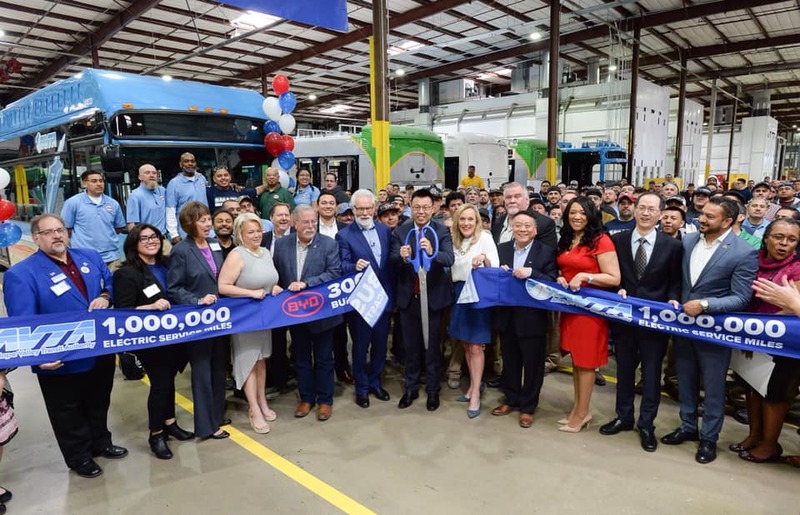 Lancaster, Calif. (4/03/19) – BYD (Build Your Dreams) announced Wednesday it produced its 300th bus at its Lancaster, Calif. manufacturing plant. BYD is celebrating the milestone with highly valued customer and neighbor Antelope Valley Transit Authority. AVTA is closing in on a landmark of its own -- 1 million miles of zero emission bus operations. AVTA expects to make that breakthrough in early May. AVTA was one of BYD’s first customers. In 2016, the AVTA board set a goal of becoming the nation’s first all-electric fleet, and vowed to convert all of its aging diesel buses. AVTA will achieve that conversion milestone later this year. “The Antelope Valley Transit Authority’s fleet of 75 currently includes about 30 electric buses, which will have completed a million miles of travel by the middle of next month. Thus far, approximately 252,000 gallons of diesel fuel has been saved with the new battery electric fleet. This equates to a net savings of $310,000 in fuel costs,” said AVTA Chairman and City of Lancaster Vice Mayor Marvin Crist. “We expect AVTA’s entire fleet to be converted to electric buses as we reach our second million miles, and the savings will be even greater by then - nearly $500,000 in fuel costs saved. Even more impressive, once our full fleet of 75 buses is complete, AVTA will boast 78% better energy efficiency; a carbon footprint reduced by 1.3 million pounds of CO2 annually; and, of course, a continued reduction in air and noise pollution." When BYD opened its Lancaster manufacturing plant in 2013, it had a handful of employees working on 10 buses in a 106,000-square-foot building that once housed a motorhome manufacturing facility. In just six years, BYD has grown to become the largest battery electric bus manufacturer in North America, with more than 750 employees. Since acquiring the facility, BYD has increased its manufacturing plant to over a half million square feet, with the capacity to produce as many as 1,500 buses a year. Li points to AVTA as a model for transit agencies seeking affordable green technology -- especially those in California needing to comply with state regulations requiring zero-emission fleets by 2040.